Whether on the road or at work, supervisors aren't always at their desks. Manager Mobile provides them with real-time notification using mobile phone alert settings—vibration, sound, badge—letting supervisors take action, no matter where they are. It's adaptive. The Manager Mobile home screen changes based on what the supervisor needs to do. Proactive alerts notify supervisors only when they need to take action… handle absences, fix missing punches, approve employee edits, or read messages. 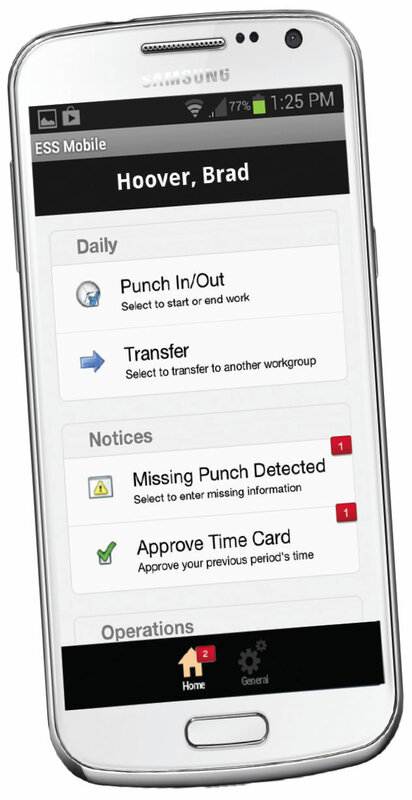 Supervisors can tackle critical absences and attendance matters right from their mobile phone. Accurate and timely information is essential to making the best choices. Manager Mobile immediately notifies supervisors when events happen and issues can be handled right in the app. Logging into the Attendance on Demand desktop isn't necessary. But when you need to, notifications can also be viewed in the desktop dashboard or delivered through email. The Manager Mobile home screen can be set up with functions that supervisors need for accurate and efficient labor management. The Daily Snapshots area presents items such as daily worked or schedule hours, employees working, or leave requests. Supervisors can also access standard functions such as log off, change password, employee search, and manage notifications, right on their mobile phone. Manager Mobile is available in Apple's App Store and in Google Play. Once mobile configuration is set up in Attendance on Demand, supervisors can download the app, enter their employer's URI, their badge/ID and PIN. The app then accesses Attendance on Demand to complete the supervisor-specific setup.